20 1ST READER "I know...I know. Man is sacred to you. Each equal before God. Creatures of the Divine Being...flowers of the Cosmic Lotus...Children of the Child." MR. LINCOLN (firmly) "I believe all of that." 1ST READER "You would...we need you...a man who acts out of the dictates of his heart, obeying the Divine Echo, swaying to the Divine Metronome...you would be a good worker. You'd even pursue the Devil beyond the Gates of Heaven. How would you react, if I told you that the same total of a man's imperfections have been metally rolled into a cosmic mental image and called God. Each man has given something...we all know secretly what God should be and he has mental being out of our collective wisdom and inadequancies. God is God to whoever needs him beyond his own adequacy. Christ was as you, beyond his adequacy he cried, "Why have thou forsaken me?" MR. LINCOLN "Let me say something." 1ST READER "Not here, now new...anything you would say would be untenderable. 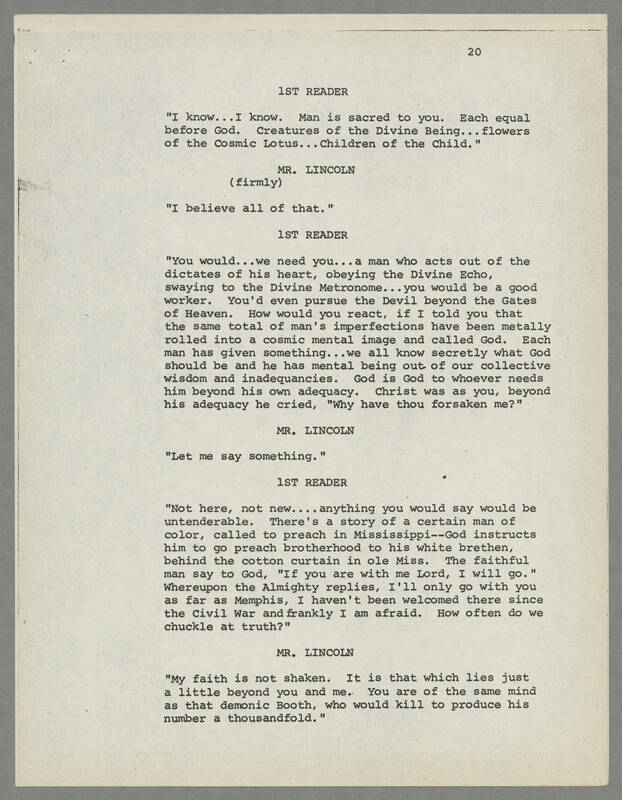 There's a story of a certain man of color, called to preach in Mississippi--God instructs him to go preach brotherhood to his white brethren, behind the cotton curtain in ole Miss. The faithful man say to God, "If you are with me Lord, I will go." Whereupon the Almighty replies, I'll only go with you as far as Memphis, I haven't been welcomed there since the Civil War and frankly I am afraid. How often do we chuckle at truth?" MR. LINCOLN "My faith is not shaken. It is that which lies just a little beyond you and me. You are of the same mind as that demonic Booth, who would kill to produce his number a thousandfold."